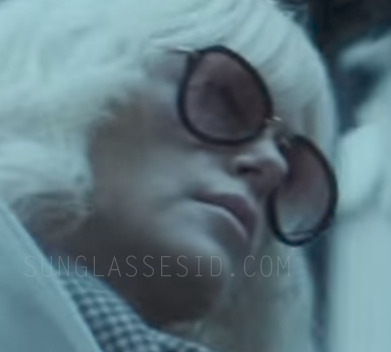 Charlize Theron wearing Miu Miu 03QS sunglasses in Atomic Blonde. Charlize Theron with the Miu Miu 03QS sunglasses in Atomic Blonde. These Miu Miu sunglasses have a black frame with gold arms and nose bridge and purple gradient lenses. The glasses can be found on Amazon and on eBay there is a selection of Miu Miu 03QS with the correct purple lenses. Theron plays Lorraine Broughton, a top-level spy for MI6, is dispatched to Berlin to take down a ruthless espionage ring. The actress also wears other sunglasses in the same film, including Saint Laurent SL93 sunglasses.